New Zealand maps from Omnimap, the leading international map store with 250,000 map titles. 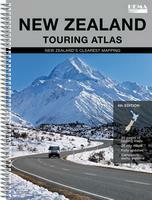 New Zealand Road Atlases, Travel and City Maps. New Zealand Atlases & Road Atlases. New Zealand Regional Road Map Series. New Zealand Topographic and Physical Maps. New Zealand 1:50,000 Topographic Maps. New Zealand 1:250,000 Topographic Maps. New Zealand 1:500,000 Topographic Maps. New Zealand 1:1,000,000 Topographic Maps. New Zealand National Park, Tourist Area, and Island Protectorate Maps. New Zealand Island Protectorate Maps. New Zealand National Park & Track Maps. New Zealand Geologic and Thematic Maps. 1:250,000 geology maps and more. New Zealand Road Atlas. Variable. Hema. This road atlas includes 23 new maps, maps of all of the National Parks and the Te Araroa Trail, 80 pages of touring maps, 47 city and suburb maps, over 1100 motorhome parks and campsites, and much more. Fully indexed. $39.99 65-0788 New Zealand Atlas. New Zealand Road Atlas. 1:500,000. Kiwi. A detailed spiral-bound road atlas with enlargements for environs of the main cities, street plans of town centers, an index of localities, roads/tracks and streets, plus information driving regulations. New Zealand North and South Island Road Atlases. 1:250,000. Kiwimap. Detailed spiral-bound road atlases of the North and South Islands of New Zealand. The main mapping is at 1:250,000 with very detailed presentation of the road network from motorways to 4WD tracks. Railway lines, ferry routes, local airfields and airstrips are marked. National Parks and protected areas are highlighted, and symbols mark places of interest, a very wide range of sport and recreational facilities, wine growing regions, hot springs and thermal areas, campsites and motorhome/caravan parks, etc. Selected walking tracks are also shown including the New Zealand Walkway and the Te Araroa Walkway. Topography is shown by relief shading, spot heights and names of various mountain ranges. Unfortunately no geographical coordinates are provided. More detailed mapping at scales of 1:150,000 to 1:175,000 cover the main metropolitan areas of New Zealand. The detailed index for each atlas has separate lists of cities/towns/localities, rural roads/tourist routes/4WD tracks/forestry road, streets for each of the plans, and rural features (mountain and passes, coastal and water features, forests/parks/conservation areas, campsites and caravan parks, dump stations, recreational area, etc). The atlas also includes lists of visitor centers, a section on road safety and traffic signs, and a distance table. $49.99 65-07881N South Island Road Atlas. $49.99 65-07881S South Island Road Atlas. New Zealand Geographic Wall Map. 1:1,700,000. Gizimap. Slightly smaller wall map than the Hema map above. This wall map of New Zealand is designed to provide a good overview of the country's topography. The map shows elevation by color-shading and spot heights It has names of various mountain ranges and selected peaks and national parks and protected areas are clearly marked. The road network includes selected rural roads and shows intermediate distances on main routes. Railways, airports and main ferry connections are marked and the map also shows local internal administrative divisions with names of the provinces. Symbols highlight tourist sites and services, including beaches, diving and windsurfing sites, skiing areas, caves, campsites, etc. The map has a latitude and longitude grid at 1° intervals. Map legend includes English. The index is on the reverse side. Also included are separate distance tables for the North and South islands, a small administrative map of the country and a map of South-western Pacific. Size is 73 x 94 cm. Image of the entire New Zealand wall map. $27.99 65-07908R 1 sheet, flat/rolled. New Zealand North and South Island Road Maps. 1:1,000,000. Hema Maps, Australia. These two maps offer excellent, concise coverage of New Zealand's North and South Islands. The maps show the islands' road networks including minor unsealed roads and indicates the main sightseeing routes. Selected hiking trails are also marked. Symbols mark various places of interest, information centres and skiing areas. Topography is shown by subtle relief shading with names of mountain ranges. National Parks are other protected areas are highlighted. The maps are indexed and have latitude and longitude lines at intervals of 1°. Sample detail from the North Island, New Zealand map. Sample detail from the South Island, New Zealand map. Front of the North Island, New Zealand map. New Zealand Travel Map. 1:1,600,000. Hema. Good quality road map of New Zealand on the front and on the reverse are city business district and suburbs maps of Christchurch, Dunedin, Queenstown, Auckland, Rotorua and Wellington, with each map accompanied by city attractions, activities and relevant travel information. $11.99 65-07903 1 sheet, folded. New Zealand Travel Map. 1:950,000. ITMB. A double-sided map showing the North Island on one side and South Island on the reverse. New Zealand has modern cities, excellent accommodations, beaches and mountains, a well-developed road network, historic sites Maori heritage displays, and much more - an excellent and popular destination. Map size is 27 x 39 inches. $12.95 65-07901 1 sheet, folded. New Zealand Travel Map. 1:1,100,000. National Geographic Maps #3500. A double-sided detailed road map of New Zealand. Contour lines at 200 meter intervals and shaded relief show elevation. Tourist sites and services are noted by symbols. Fully indexed. Double-sided map, printed on waterproof, tear-resistant synthetic paper. The base map is by Reise Know-How, with NGS adding data and formatting the map in their classic adventure map format. ISBN 9781566955492. $11.95 65-07900 1 sheet, folded. New Zealand Geographic Travel Map. 1:1,700,000. Gizimap. Slightly smaller wall map than the Hema map above. This map is designed to provide a good overview of the country's topography. The map shows elevation by color-shading and spot heights. It has names of various mountain ranges and selected peaks and national parks and protected areas are clearly marked. The road network includes selected rural roads and shows intermediate distances on main routes. Railways, airports and main ferry connections are marked and the map also shows local internal administrative divisions with names of the provinces. Symbols highlight tourist sites and services, including beaches, diving and windsurfing sites, skiing areas, caves, campsites, etc. The map has a latitude and longitude grid at 1° intervals. Map legend includes English. The index is on the reverse side. There are distance tables for the North and South islands, a small administrative map of the country and a map of South-western Pacific. Size is 73 x 94 cm. Sample detail of the New Zealand road map. $14.99 65-07908 1 sheet, folded. New Zealand Travel Map. 1:1,250,000. Nelles Verlag. A good road map of New Zeland with the road network overlain on a shaded relief / physical base map. Multilingual legend. $13.95 65-0790 1 sheet, folded. New Zealand 1:250,000 Rural Road Quadrangle Maps. 1:250,000. Kiwimaps. This new map series makes excellent touring maps of New Zealand. The maps have shaded relief to show elevation, numerous spot heights, liberal use of symbols to show tourist sites and services, scenic routes, and more. Each map is extensively indexed with named rural roads. Sample from the Auckland map sheet. Index map shows the sheet layout. $16.99 65-0752K-01 Far North. Sheet 1. $16.99 65-0752K-02 Northland. Sheet 2. $16.99 65-0752K-03 Auckland - Coromandel. Sheet 3. $16.99 65-0752K-04 Waikato - Bay of Plenty. Sheet 4. 1987. $16.99 65-0752K-05 East Cape. Sheet 5. $16.99 65-0752K-06 Taranaki - Ruapehu. Sheet 6. $16.99 65-0752K-07 Hawke's Bay. Sheet 7. $16.99 65-0752K-08 Wellington - Wairarapa. Sheet 8. $16.99 65-0752K-09 Nelson - Marlborough. Sheet 9. $16.99 65-0752K-10 North Westland. Sheet 10. $16.99 65-0752K-11 Marlborough - Kaikoura. Sheet 11. $16.99 65-0752K-12 South Westland. Sheet 12. $16.99 65-0752K-13 Canterbury. Sheet 13. $16.99 65-0752K-14 Southern Lakes. Sheet 14. $16.99 65-0752K-15 Otago - Southern Canterbury. Sheet 15. $16.99 65-0752K-16 Fiordland. Sheet 16. $16.99 65-0752K-17 Otago - Southland. Sheet 17. $16.99 65-0752K-18 Stewart Island. Sheet 18. New Zealand City Maps. 1:30,000 & larger-scale inset maps. Kiwimaps. This popular NZ-based map publisher offers a good selection of street maps and atlases for New Zealand cities. The ones below are currently in stock - other maps are coming. Sample of the map detail from the Dunedin map. Sample of the map detail from the New Plymouth map. $8.95 65-0792NO North Shore Auckland. 2007. $12.99 65-0792AU Auckland. 2008. Includes large-scale Inner City map. $11.95 65-0792CH Christchurch. 2008. Includes Ashburton, Rangiora & 19 Canterbury Towns. $8.95 65-0792CO Coromandel. 2008. Includes Franklin District & 51 town maps. $12.99 65-0792DU Dunedin, Mosgiel, Oamaru, & 12 Otago Towns. 2008. $8.95 65-0792GI Gisborne. Includes 20 Eastland towns. $8.95 65-0792HA Hamilton City. Includes Cambridge, Te Awamutu, Kihikihi, Ngaruawahia, and Huntly. $8.95 65-0792IN Invercargill, Stewart Island, & 22 Southland Towns. 2007. $8.95 65-0792MA Masterton. Includes 13 Wairarapa town maps. $8.95 65-0792NA Napier, Hastings, & 12 Hawke's Bay Towns. 2008. $12.99 65-0792NE Nelson. Includes Blenheim, Picton, and 17 town maps. $8.95 65-0792NF New Plymouth. 2008. Includes 23 Taranaki town maps. $8.95 65-0792OR Orewa, Warkworth, Whangaparaoa. 2007. $8.95 65-0792QU Queenstown. Includes 14 southern provincial town maps. $12.99 65-0792RO Rotorua, Whakatane, & 12 Central Bay of Plenty Towns. 2007. $8.95 65-0792PA Palmerston North, Levin, Feilding, & 19 Towns. 2007. $8.95 65-0792TAU Taupo. Includes Tokorao, Turangi, and 19 town maps. $12.99 65-0792TB Tauranga, Mt. Maunganui & 10 Provincial Bay of Plenty towns. 2008. $8.95 65-0792TI Timaru, Ashburton, & 19 South Canterbury towns. 2008. $8.95 65-0792WA Wanganui, Marton, & Taihape. 2007. $12.99 65-0792WE Wellington. Includes a large-scale central city map and maps of the Kapiti Coast and Levin. $8.95 65-0792WF West Coast. Includes Greymouth, Hokitika, Westport, and Reefton. $8.95 65-0792WH Whangarei, Bay of Islands. 2007. Wellington City Street Map. 1:35,000 & detailed city-center maps. Kiwimap. Includes main routes, scenic routes, state highways, parks, schools, fully indexed. $9.95 65-0775T 1 sheet, folded. Wellington City Street Map. 1:10,000. Freytag + Berndt. Includes public transportation routes and a street indexe. Map size is 94 x 125 cm. $12.99 65-0792WT 1 sheet, folded. Wellington City Street Atlas. 1:11,000 & 1:25,000 & 1:275,000. Kiwimap. Detailed spiral-bound street atlas of Wellington and surrounding area. Includes neighborhood-center inset maps, tourist routes, motorway guide, educational facilities, fully indexed, etc. New Zealand is quite well mapped and complete coverage is available at both 1:250,000 and 1:50,000 (which replaced the older 1:63,360 series). In addition to these topographic series, DOSLI produces a wide range of tourist-oriented maps; 1 to four-sheet physical and topographic maps that make excellent road maps; and city plans. New Zealand Topographic Quadrangle Maps. 1:50,000. New Zealand Department of Survey and Land Information. Complete coverage is now available for New Zealand. We stock partial coverage - delivery time on the other sheets is about 2 weeks. Index map for the North Island. Index map for the South Island. Itemized listings - Click here to order individual quadrangles. Note that this is the listing for the old series - we will ship the corresponding New Series map. I hope to have the listing of the New Series sheets on-line in the next two weeks. $17.95 65-0750 Specify sheet number at check-out. New Zealand 1:250,000 Topographic Quadrangle Maps. 1:250,000. New Zealand Department of Survey and Land Information. Relief shading and contours, at 100m intervals, are used to show the terrain on these clear maps. Very good road and settlement detail, with everything from state highways to foot tracks and major cities to hut settlements shown. Other features include radio, TV and microwave masts, major power lines, airports and aerodromes, lighthouses, stopbanks. Various natural features, such as mangroves, swamps, native and exotic forests are also marked. Each map covers an area 150km by 200km. Grid squares at 10km interval and latitude and longitude margin ticks at 1' intervals. Uses the New Zealand grid. Index map for the North Island (1 meg). Index map for the South Island (1 meg). $17.95 65-0752-01 Sheet 1 - North Cape topographic map. $17.95 65-0752-02 Sheet 2 - Kaikohe topographic map. $17.95 65-0752-03 Sheet 3 - Warkworth topographic map. $17.95 65-0752-04 Sheet 4 - Dargarville topographic map. $17.95 65-0752-05 Sheet 5 - Auckland topographic map. $17.95 65-0752-06 Sheet 6 - Tauranga topographic map. $17.95 65-0752-07 Sheet 7 - East Cape topographic map. $17.95 65-0752-08 Sheet 8 - New Plymouth topographic map. $17.95 65-0752-09 Sheet 9 - Taumarunul topographic map. $17.95 65-0752-10 Sheet 10 - Napler topographic map. $17.95 65-0752-11 Sheet 11 - Gisborne topographic map. $17.95 65-0752-12 Sheet 12 - Takaka topographic map. $17.95 65-0752-13 Sheet 13 - Nelson topographic map. $17.95 65-0752-14 Sheet 14 - Palmerston North topographic map. $17.95 65-0752-15 Sheet 15 - Dannevirke topographic map. $17.95 65-0752-16 Sheet 16 - Wellington topographic map. $17.95 65-0752-16 Sheet 17 - Greymouth topographic map. $17.95 65-0752-17 Sheet 18 - Murchison topographic map. New Zealand Topographic Maps (Coast-to-Coast series). 1:500,000. New Zealand Department of Survey and Land Information. A series of four maps covering both islands of New Zealand. Beautifully coloured with relief shading of the terrain and spot heights. Main highways are clearly shown and numbered. Forests, swamps, mangroves, airports, towns and cities are among the features marked. Latitude and longitude grid squares at 1° intervals with ticks at 1' intervals. $16.95 65-0754-1 Further North sheet. 1989. $16.95 65-0754-2 North sheet. 1995. $16.95 65-0754-3 North Meets South sheet. 1995. $16.95 65-0754-4 South sheet. 1989. New Zealand Topographic Map. 1:1,000,000. New Zealand Department of Survey and Land Information (#265). 1989. Beautifully coloured with relief shading of the terrain and spot heights. Main highways are clearly shown and numbered. Forests, swamps, mangroves, airports, towns and cities are among the features marked. Latitude and longitude grid squares at 1° intervals with ticks at 1' intervals. Mt. Ruapehu Eruption poster. Craig Potten, NZ. This superb photo shows a large ash eruption of Mt. Ruapehu, located in Tongariro National Park. This 2,797 meter (9,176 ft.) is New Zealand's largest active volcano. $12.95 65-0784-RU 1 sheet, rolled. Tongariro National Park poster. Craig Potten, NZ. This spectacular photo shows the volcanoes for which Tongariro is famous. In the foreground is a small lake, colored a wonderful blue, with volcano cones in the background. Printed on glossy photo paper, size is 23 x 17½". $12.95 65-0784-TO 1 sheet, rolled. New Zealand Topographic Hiking Maps. NewTopo, New Zealand. These maps are designed to encourage hiking in three of the most popular hiking areas of New Zealand. Easy to read, showing essential topographic information without clutter. A realistic landform provides a useful geographic context. The road network is very detailed and yet is clear and easy to follow. Car parks are shown at track entry points. $13.99 65-0773-ALP Abel Tasman Coast Track hiking map. 1:65,000. 2008. $13.99 65-0773-AOT Aotea Great Barrier Reef hiking map. 1:90,000. 2008. $13.99 65-0773-AUN Auckland Walks: North hiking map. 1:75,000. 2007. $13.99 65-0773-AUS Auckland Walks: South hiking map. 1:75,000. 2007. $13.99 65-0773-BAN Banks Peninsula hiking map. 1:60,000. 2009. $13.99 65-0773-DUN Dunedin Walks - Silver Peaks to Taiaroa Head hiking map. 1:75,000. 2009. $13.99 65-0773-QUE Queen Charlotte Track, Marlborough Sound, hiking map. 1:75,000. 2008. $13.99 65-0773-RAN Rangitoto and Waiheke Islands hiking map. 1:42,000. 2007. $13.99 65-0773-ROU Routeburn Track, Mt. Aspiring and Fiordland National Parks hiking map. 1:50,000. 2008. $13.99 65-0773-RUA Ruapehu Round the Mountain Track, Tongariro N.P. hiking map. 1:60,000. 2009. $13.99 65-0773-TAR Tararua Tramps hiking map. 1:75,000. 2005. $13.99 65-0773-TON Tongariro N.P. hiking map. 1:60,000. 2009. $13.99 65-0773-ALP Tongariro Alpine Crossing hiking map. 1:40,000. 2008. $13.99 65-0773-WEL Wellington Walks hiking map. 1:75,000. 2005. New Zealand National Park Topographic Maps. New Zealand Department of Survey and Land Information. This includes New Zealand's Trackmap and Parkmaps series. These maps illustrate the spectacular scenery of New Zealand's mountains and rocky coastal shores. Each map has full topographic detail, hiking trails, and other tourist information. $16.99 65-0774B Abel Tasman park map. 1:50,000. #273/7. 2006. $16.99 65-0774CO Coromandel park map. 1:150,000. 336/11. 2006. $14.95 65-0774F Egmont park map. 1:50,000. 273/9. 1994. $14.95 65-0774H Fiordland park map. 1:250,000. 273/3. 2004. $14.95 65-0774KC Kaweka park map. 1:100,000. 274/12. 1990. $16.99 65-0774KE Kepler Track park map. 1:50,000. 335/9. 2003. $16.99 65-0774M Milford Track park map. 1:75,000. 335/1. 2003. $16.99 65-0774N Nelson Lakes park map. 1:100,000. 273/5. 2011. $14.95 65-0774NP Paparoa park map. 1:50,000. 273/12. 1990. $16.99 65-0774RO Routeburn and Greenstone Tracks park map. 1:75,000. #335/2. 2004. $14.95 65-0774ST St. James & Lewis Pass park map. 1:50,000. 335/06. $14.95 65-0774TA Tararua park map. 1:100,000. 274/2. 1988. $14.95 65-0774R Urewera park map. 1:130,000. 273/8. 1993. New Zealand Island Possessions Topographic Maps. New Zealand Department of Survey and Land Information. These maps cover some of New Zealand's protectorate islands in the South Pacific Ocean. $15.95 65-0772B Antipodes map. 1:25,000. 1978. $15.95 65-0772D Auckland map. 1:50,000. 1991. $15.95 65-0772S Snares Island & Bounty Island map. 1:25,000. 1981. $17.95 65-0772W Waiheke Island map. 1:50,000. #336/3. 1989. Free-Air Gravity Field of the New Zealand Region. 1:3,000,000. Geol. Soc. America (MC-48). 1983. Covers New Zealand, the Kermadec Trench, and the surrounding region. With 8-page text. Geological Resource Map or Chatham Island. 1:50,000. Institute of Geological and Nuclear Sciences. #QM405. With separate text booklet. Southern Oceans gravity anomaly, New Zealand region. 1:4,000,000. Institute of Geological and Nuclear Sciences. 1996. New Zealand Soils Map. 1:253,440. 1954-1969. NZ DSIR. This set of 21 sheets covers the North and South Islands. A 690-page text accompanies the maps. 1:250,000 Geological Map of New Zealand (old series). 1:250,000. Institute of Geological and Nuclear Sciences. This is the older series being replaced by the new series noted above. Please note that the sheet numbers do not correspond between the two series. Please look at the index map for each series to choose the appropriate map. $19.95 65-0758-02A Sheet 2A. Whangarei. 1961. $19.95 65-0758-07 Sheet 7. Taranaki. 1967, reprinted 1975. $19.95 65-0758-16 Sheet 16. Kaikoura. 1963, reprinted 1975. $19.95 65-0758-17 Sheet 17. Hokitika. 1967, reprinted 1975. $19.95 65-0758-18 Sheet 18. Hurunui. 1964, reprinted 1975. $19.95 65-0758-19 Sheet 19. Haast. 1965, reprinted 1975. $19.95 65-0758-20 Sheet 20. Mt. Cook. 1968, reprinted 1975. $19.95 65-0758-21 Sheet 21. Christchurch. 1973. $19.95 65-0758-27 Sheet 27. Fiord. 1960. $3.99 67-1070NEW New Zealand flag, small. Size 4 x 6 in. $9.95 67-1071NEW New Zealand flag, medium. Size 8 x 12 in. $49.95 67-1073NEW New Zealand flag, large. Size 2 x 3 ft.